Cook lasagna noodles to desired doneness as directed on package. Drain; place in cold water. Cook frozen broccoli until crisp-tender as directed on package. Drain. Meanwhile, melt margarine in medium saucepan over medium heat. Stir in flour, onions, salt, dry mustard, thyme and ground red pepper. Gradually add milk, stirring constantly. Cook and stir until mixture is bubbly and thickened. Remove from heat. Add Monterey Jack cheese; stir until melted. Heat oven to 350°F. Drain noodles. In ungreased 13x9-inch (3-quart) baking dish, layer 1/2 cup sauce, 3 noodles, all of the cooked broccoli, 1/2 cup of the Cheddar cheese and 1 cup sauce. 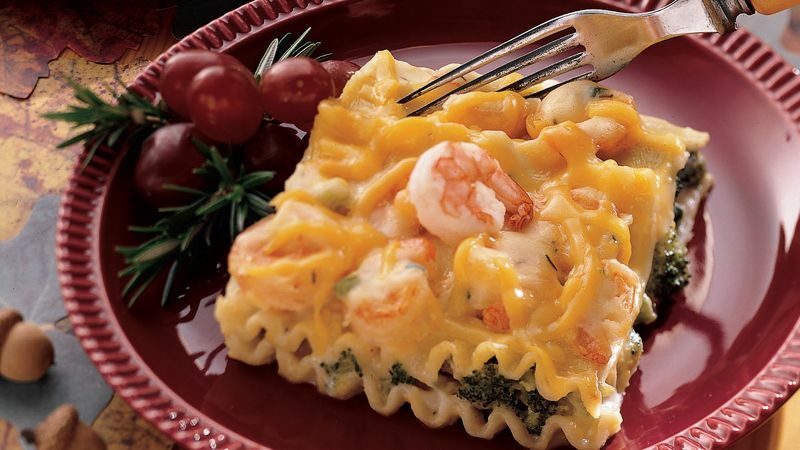 Top with remaining noodles, all of the shrimp, 1 cup of the Cheddar cheese, the remaining sauce and the remaining cheese. Bake at 350°F. for 30 minutes or until hot and bubbly. Let stand 10 minutes before serving.